IT WAS the news that would have left a worse taste in the mouths of Hawthorn supporters than the over-priced food at the MCG - the ultimate comedown after the high of watching their team's grand final win over Fremantle. 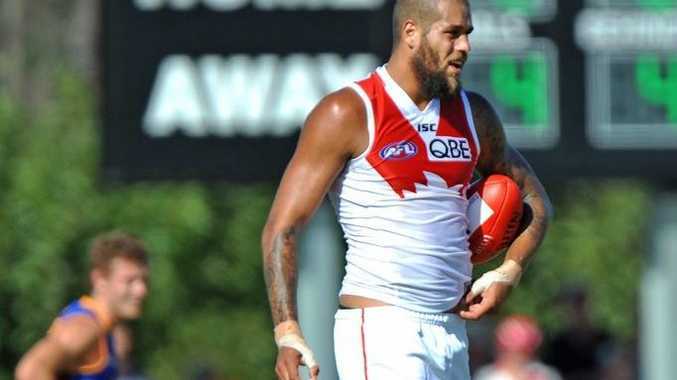 Lance Franklin's defection to Sydney on a nine-year mega deal was the most controversial player move in recent times. And although Hawthorn itself may have moved on - and is well placed to go "back to back" - fans of the brown and gold won't have forgiven so easily, especially when they see their former idol wearing a red and white jumper and charging into their boys, such as his great mate Jarryd Roughead, while wearing a red and white jumper. If they can't make it to Sydney's ANZ Stadium for the Friday night blockbuster between the Swans and Hawks in round eight, they will be out in force with their anti- Buddy banners at the MCG 10 rounds later ... and maybe again in September. The competition's past two premiers, the Hawks ($4.75 favourite with Sportsbet) and Swans ($6), are well fancied for this year's flag, along with last year's runner-up, Fremantle ($5). Franklin will share the forward half - and about $2 million a year - with Kurt Tippett, and they will have the support of Australian of the Year Adam Goodes and a resurgent Gary Rohan to complement arguably the league's best midfield. Although the Hawks have lost a "Buddy", they have gained a "Big Boy", ruckman Ben McEvoy, who after an initial shock must have been rubbing his hands together at the prospect of being cut loose by a free-falling St Kilda and traded to the defending champs to link up with Sam Mitchell and co. It remains to be seen whether the new arrivals out west - the one prone to injury, Scott Gumbleton (Essendon), and the one prone to being out of form, Colin Sylvia (Melbourne) - will help the Dockers' bid for a first flag. However, with the "next big thing" - leading Brownlow Medal fancy Nat Fyfe - in their arsenal, big things can be expected. Whatever happens at the "business end" of the season, the frantic "business decisions" made by clubs and players during last October's free agency and trade period have ensured it will be an emotion-charged season. Brendon Goddard's reaction after Essendon's round-four clash with St Kilda last season shows just how "moving" it can be playing for the first time against the club to which you have given so much service. Nick Dal Santo will be in Goddard's shoes in round 17, having followed in his former teammate's footsteps by marching out of St Kilda, after 260 games over 12 years, and crossing to North Melbourne to boost both its midfield and its chances of becoming a genuine flag threat. But don't expect 2014 to be a season full of "watching the big men cry". With many players having chased the comforts of sweeter deals - or the comforts of home sweet home - it will be safe to expect more jeers than tears. After feeling the adoration of the Black-and-White Army for eight years, one-time favourite son Dale Thomas will feel its wrath when he steps out for Collingwood's arch enemy, Carlton, in round seven, after signing with the Blues for $600,000 a year. Fortunately for Heath Shaw, who has accepted a deal worth %$3.5 million over five years to join GWS, he has until round 22 to wait before taking on the Magpies in Blacktown. Then there's 32-year-old warhorse Paul Chapman. After being dumped by Geelong despite his three premierships with the club, he may decide to give the Cats' coaching staff a subtle two-finger salute when he helps form a dangerous Essendon attack against his old side in round 15.